Tup Island also known as Tub Island, Koh Tap or Koh Thap is one of the most popular offshore islands around Krabi for day trips and tours. Most island hopping tours come here to witness and photograph the amazing parting of the seas. 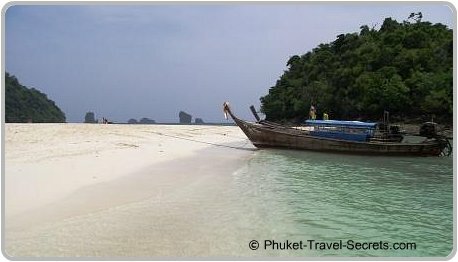 Koh Tap is located in the Mu Koh Poda archipelago just south west of Ao Nang between Koh Poda and Chicken Island. Tup is much smaller than the other islands in the group, however it has a nice beach and the waters that surround it provide an excellent spot for snorkeling with an abundance of tropical fish. At low tide a sandbar emerges from the clear waters linking the larger Chicken island to the two smaller islands of Koh Mor and Tup. This picturesque and unique occurrence is commonly referred to as Talay Waek which means divided sea. 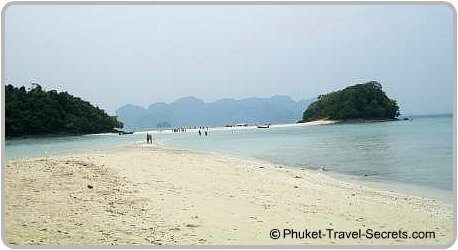 On low tide you can walk across the sandbar from Chicken Island to Koh Mor on the left or Tup on the right. The whole area is picturesque with stunning panoramic views of the Krabi coastline in the background. 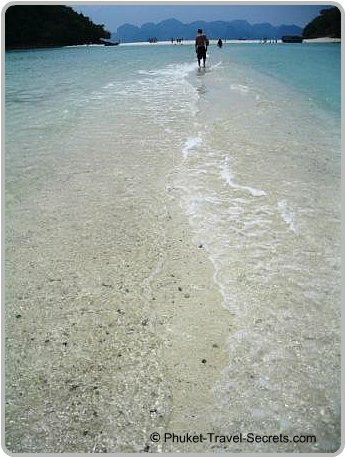 When walking across the sandbar it is wise to take a pair of reef shoes or at least flip-flops as sharp corals and shells emerge from the water, making it quiet uncomfortable under foot. The shallow waters at Tup make for a safe haven if you are island hopping with young kids, the water is deep enough on either side of the sandbar to relax and cool down. 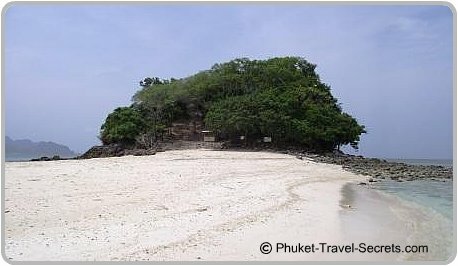 Tup Island is included in Krabi’s Four Island Tour which is one of the best day trips offshore of Krabi. 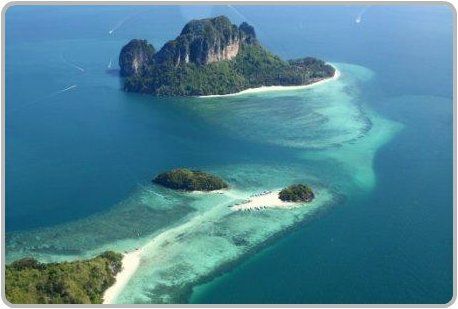 The other islands that are visited during the four island tour include Koh Kai also known as Chicken Island, plus the beautiful Phra Nang Cave Beach which is located on the Railay Peninsula and Ko Poda. Being one of Krabi’s main tourist attractions Tup Island can get be very busy, more so during the high season when day trips and tour groups arrive. From Ao Nang you can get a return longtail boat to Tup for 300 baht per person, the only downside to this is you may have to wait for other passengers to join you before the boat will leave, which is normally a minimum of eight people. Or alternatively you can charter a private longtail boat with a driver to take you island hopping to all four islands for 2,200 baht. We decided to take this option and thoroughly enjoyed our day snorkeling, swimming and exploring Krabi’s beautiful offshore islands. Just make sure that the boat driver includes snorkeling gear in the price of the boat. You can also get longtail boats at other beaches including Klong Muang, Nopparat Thara, Railay and also at Chao Fah pier in Krabi Town. The prices from these areas may be slightly different from those that we paid in Ao Nang. If you would like to pre-book your Krabi tours you can, contact Easy Day Thailand who will take care of everything for you, they hold all the appropriate licences and insurance.